In the past when I’ve rounded up Oh My Veggies’ most popular posts at the end of each year, I’ve noticed a pattern — they’re usually all from the first half of the year because those posts have had a longer time to accumulate pageviews. So this year, I went through month-by-month and chose the most popular recipe for each. Did I spend way too much time thinking about this? Absolutely! But I like this way better. 2014 has been a year of change for Oh My Veggies and for me personally. On the Oh My Veggies front, I decided to take the blog from being my personal food blog to a team-based blog with 8 different writers. I hired an editor and a recipe tester to make sure every recipe works out before it’s posted, did a huge redesign in two phases, and bumped up the posting schedule to 7 days a week. I’m really proud of the blog Oh My Veggies has become and I’m excited to see what the next year has in store. It turns out that making Oh My Veggies a team blog was a good idea because I really needed a team this year. At the end of the summer, my husband and I moved back to the Chicago area, where we’re originally from. The cross-country move from North Carolina was a big, huge change for us and a week after moving, we had another big, huge life-changing moment when I found out I was pregnant. We decided to move back to Illinois to start a family, so the timing was eerily perfect and we were completely thrilled at the news. And then a few days after that, the food aversions and all day morning sickness started, which wasn’t nearly so thrilling. 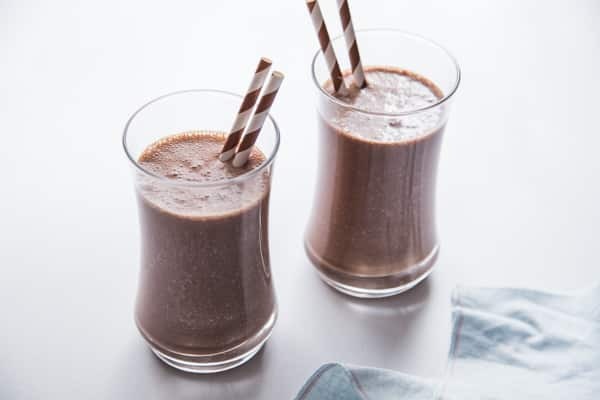 In my 4th month of pregnancy, the constant nausea finally shifted into nighttime only and the food aversions aren’t quite so bad anymore — I still can’t say the word “kale” without gagging, but there were weeks where I could only eat pretzels, bread, pancakes and other bland foods and even those were a struggle. It’s really strange to wake up one day and suddenly all your favorite foods turn your stomach. I have so much empathy for picky eaters now, because I’ve totally become that person who wants cheddar, but only if it’s orange or a baked potato, but only if it’s from Wendy’s. Yeah, I don’t know either. Being a food blogger and dealing with these intense food aversions and a hair-trigger gag reflex (even thinking about food would literally make me sick!) was interesting to say the least and I’m so grateful for the help of the whole Oh My Veggies team in picking up my slack and pitching in to write extra posts over the past few months. 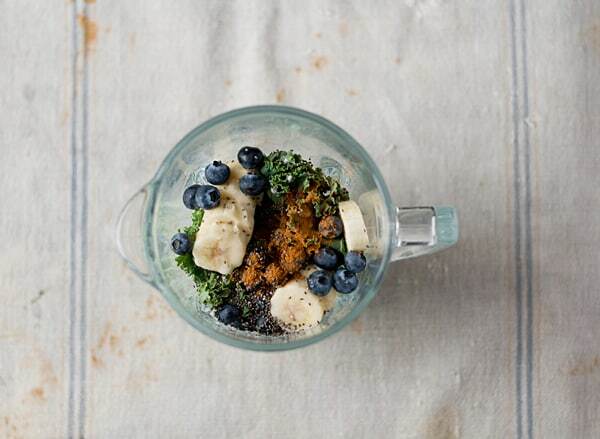 Kale Ginger Detox Smoothie // We kicked off 2014 with Smoothie Week and this spicy ginger version made with kale and blueberries was a reader favorite. 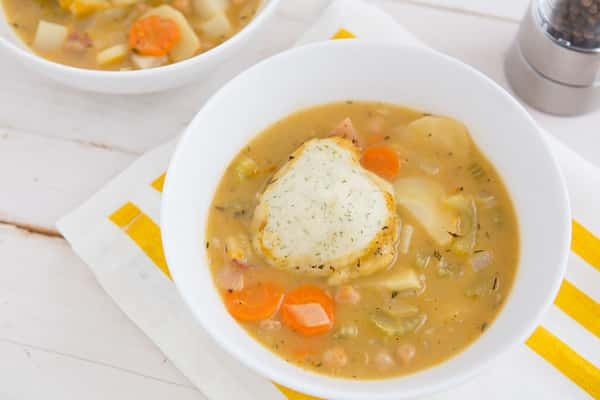 Chickpeas and Dumplings // One of my favorite new features this year is Make It Meatless, where we take recipes traditionally made with meat, like Chicken and Dumplings, and make them vegetarian using whole food ingredients (no meat substitutes!). One-Pot Pasta Primavera // Easy weeknight dinners are always a winner around here and this creamy, veggie-packed pasta is the kind of recipe that’s sure to become a staple in your kitchen. 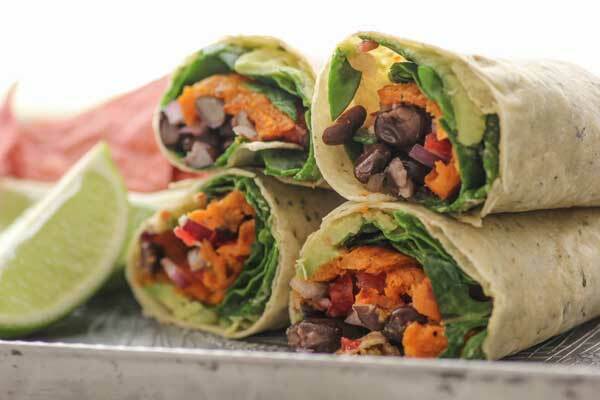 Southwestern Veggie Wraps // Roasted sweet potatoes are the best kind of sweet potatoes and combining them with smoky black beans, guac and greens makes for a delicious, healthy lunch wrap. 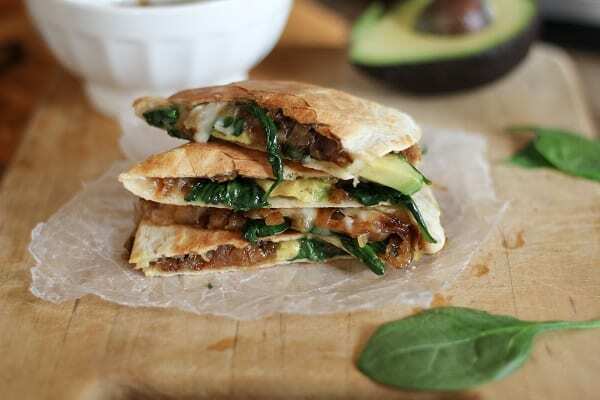 Caramelized Onion, Spinach & Avocado Quesadillas // I hate the phrase “ooey-gooey,” but there’s no other way to describe these quesadillas. They’re messy to eat, but so worth it. Jamaican Chickpea Stew // Another Make It Meatless post! And another post where we replaced chicken with chickpeas. I tested this recipe myself and I was impressed with how easy it was to make — and how such a simple list of ingredients produced such a flavorful dinner. 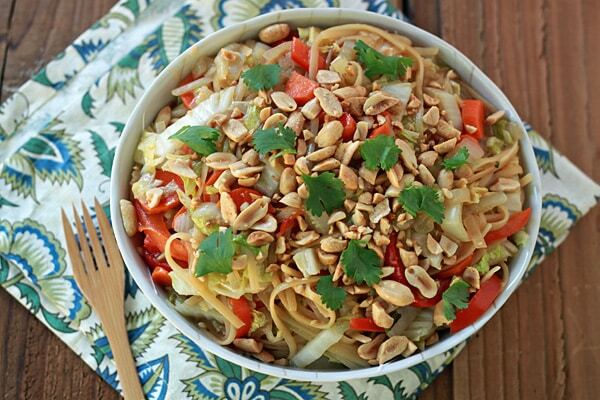 One-Pot Peanut Sesame Noodles // 2014 is definitely the year of one-pot everything, so it’s no surprise that this was our most popular post in August. 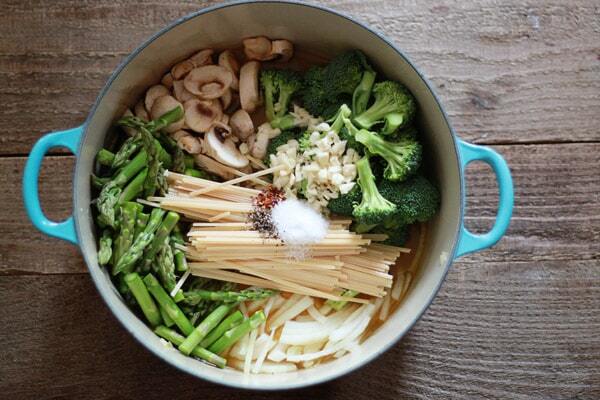 It’s an Asian-inspired twist on one-pot pasta. Cheesy Taco Casserole // …and then it was fall and everyone started looking for comfort food and casserole recipes. 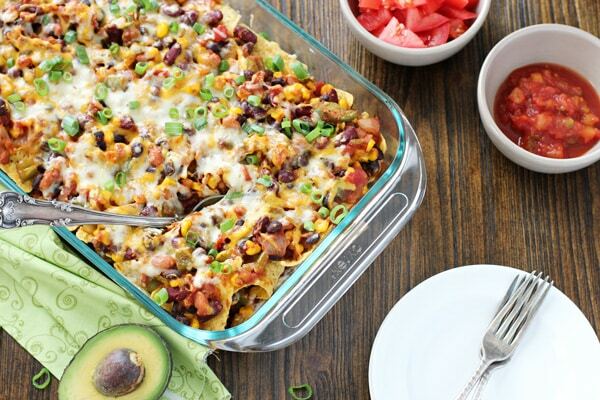 This cheesy taco casserole is kind of like baked nachos topped with veggies, beans and cheese. 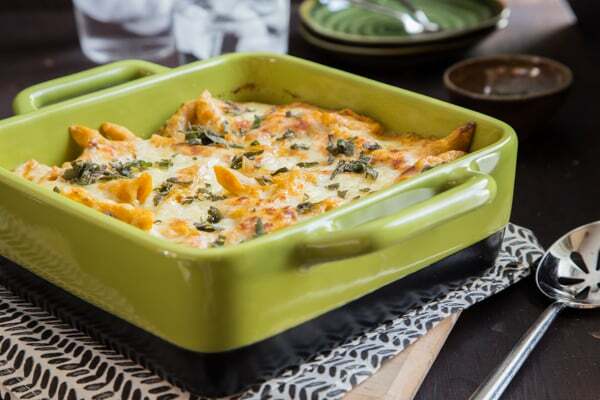 Pumpkin-Sage Baked Ziti // Another casserole! Pasta and a creamy pumpkin sauce are baked under a layer of shredded cheddar, then topped with crispy sage leaves. This is one of my personal favorites for 2014 too. 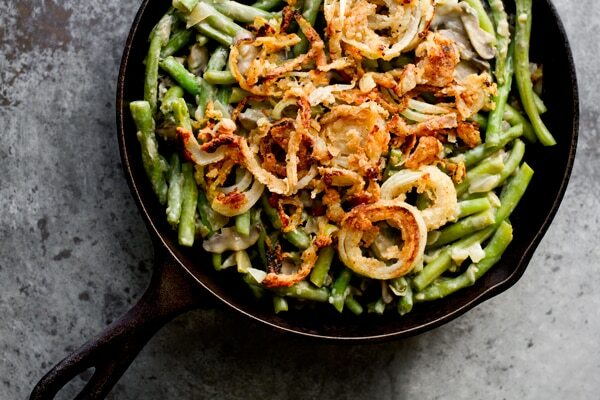 Vegan Green Bean Casserole // It just isn’t Thanksgiving without a green bean casserole — and you don’t have to skip it if you’re vegan because you can make our version instead! Even the crispy onion topping is homemade. Thanks for reading in 2014 and Happy New Year! Love the round up and super excited to see what 2015 has to offer! 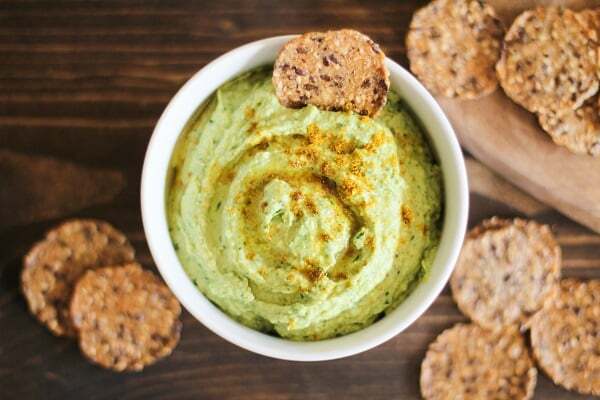 I’ve got to say – that kale dip looks wonderful! As I scrolled down this post I had a difficult time deciding on a fave, there were so many yummy recipes this year! Congrats on your pregnancy! Food aversions are crazy. I have drank coffee every morning for years, and with my 3rd child…I went for months not being able to touch it! Then one day, the aversion was gone. It IS crazy – it’s really freaky to wake up one day and suddenly hate all the foods you love. And it really was the foods that I loved the most that I hated the most. I couldn’t even think about vegetables for 2 months and there still are a lot of them that I have to avoid. Happy New Year to you too! Thanks so much for all the hard work. Your blog is my go-to resource for vegetarian recipes! The Southwestern Veggie Wrap! Yummmmm! Those have made me a rock star for family get togethers—Thank You! Happy New Year! Wishing you peace this new year. I’m glad to hear the recipe is a hit with your family. 🙂 Happy New Year! CONGRATS!!! Oh that is so so so exciting. I’m so glad you moved at the perfect time and I wish you all the best with your pregnancy!!! 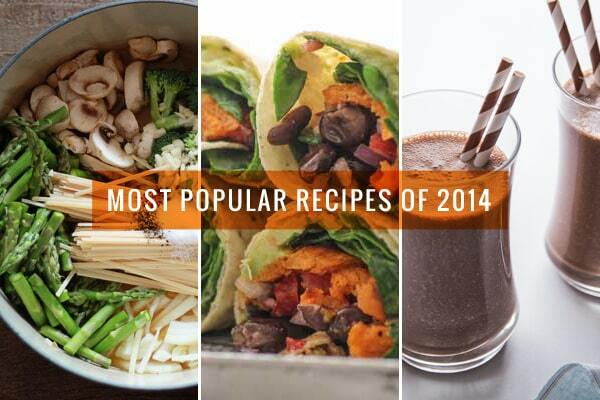 These recipes look stellar (of course) but I can’t pick just one favourite. I do supposed if forced 🙂 the southwestern wraps would be my favourite! Thank you! It’s funny how the timing worked out like that and I am so glad we decided to move when we did. 🙂 Happy New Year! Wow, you’ve done some great cooking. Have a great 2015!! Congratulations on being pregnant!! We have been so busy for several months now that I haven’t had the time to check on my favorite bogs so I missed that exciting news. All of the recipes look so delicious but I am thinking I need to make us some of that Mexican Hot Chocolate like today!! Happy New Year and I hope this coming year brings you an abundance if Gods Blessings! Thank you! I’ve been terrible at keeping up with other blogs lately too, so I understand. 🙂 Happy New Year to you too! You’ve had some exciting changes lately, Kiersten, yet you’ve managed to keep PotLuck and OhMyVeggies looking and running fabulously! Thank you for your support, leadership and always providing helpful and delicious recipes! Have a fabulous year (and I hope a bit more restful – if at all possible!). Thank you! I think 2015 might end up being even crazier than 2014, but hopefully I can work some R&R in there somewhere. 😉 Happy New Year! Happy New Year to you and your growing family and blogging team Kiersten! Yours was one of the first blogs I started reading several years back and you were so helpful to me in starting mine! I wish you much continued success and boatloads of happiness with your family and new home! I love the roundup! 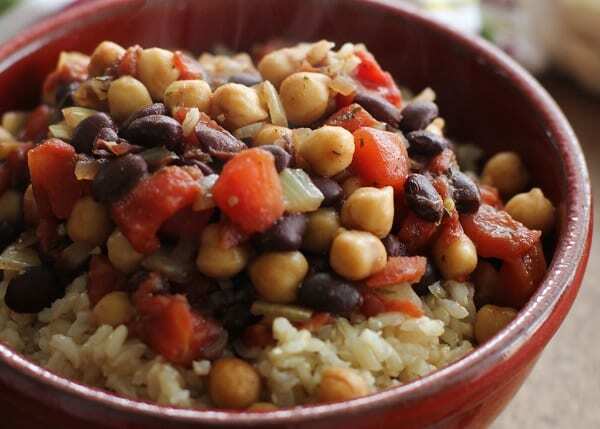 The Jamaican Chickpea Stew looks wonderful. Kiersten, thank you sooo much for your blog. This site was what I need to start meal planning in 2014 and to offer better food diversity to my family. I am also on maternity leave so I need to be organized, living with a toddler and a new born! I pretty much only pick from your blog or the PotLuck recipes; not once were we disappointed! LOve! Love! Love! I was very sad when we could no longer bookmark your recipes in a recipe box. The Epicurious Clipper worked for a while and now it doesn’t (they don’t offer support, to solve my problem). Oh well! Now that you’ll have a tiny mouth to feed maybe you’ll want to add a “Kid’s approved” section to your blog in a year or two! Wishing you the best of luck, hope you can breastfeed, it is the best food ever! Unfortunately, ZipList ceased operations at the end of last year and I’m still working on finding an alternative that will allow users to save recipes. But know that it is something I’m working on! As for the giveaways, we’re at the mercy of our sponsors and since most sponsors are based in the US, most will only ship to the US. Wh-wh-wh-WHAT?! You’re pregnant? Eeeee! Congratulations! How did I miss THAT nugget?! AND you moved from NC? No more backyard gardening? 🙁 Or do you have a new backyard to christen with raised beds?? You missed it because I never really announced it – ha! 🙂 And guess what? The house we bought already has raised beds in the backyard. I was mourning the loss of all my strawberry plants (started by seed!) when we moved and the previous owner of our new house has an entire bed of strawberries. So clearly it was meant to be.